이옥희, 장순옥, 박민정,(2008).초등학생의 영양교육에 따른 영양지식, 식생활태도 및 식습관의 비교.한국식품영양과학회지,37(11),1427-1434. 본 연구에서는 초등학교 1학년에서 4학년까지의 급식 아동 중 편식이 있는 아동들을 선정하여 각 학년마다 비슷한 인원수로 교육군과 교육을 받지 않는 대조군으로 배정하였다. 교육군은 영양사가 직접 주 1회 8주간 영양교육을 학년마다 분리하여 실시하였으며, 교육군과 대조군 모두 교육전후에 영양지식, 식생활 태도, 편식과 관련된 식이 자기효능감, 편식교정인자, 일반 식습관 등을 조사하여 영양교육에 따른 변화를 비교하고자 하였다. 영양지식과 식생활태도는 교육집단은 교육 전 4.1±2.0점과 18.9±3.7점에서 교육 후 9.5±2.3점과 22.4±2.7점으로 각각 유의하게 증가하였다(p＜0.01, p＜0.001). 그러나 식생활태도는 교육집단의 경우 교육 후 10항목 중 7항목에서 유의적인 변화를 보여 긍정적인 변화를 보인 반면, 대조군은 모든 항목에서 유의적인 변화를 보이지 않았다. 편식과 관련된 식이 자기효능감은 영양교육에 의해 저지방?저열량 조리법의 음식을 선택할 항목을 제외하고 개선되어 9.9±2.8에서 12.6±2.0으로 유의적 향상을 보였다(p＜0.001). 편식교정인자는 영양교육에 의해 편식 여부, 식습관 수정 필요, 편식하는 식품군, 새로운 음식이나 싫어하는 음식에 대한 태도 등이 유의적으로 변화하였다. 그러나 기름을 많이 사용한 식품의 섭취, 간식섭취에 의한 결식, 인스턴트와 패스트푸드 섭취 항목은 영양교육에 의해 개선되지 않았다. 교육에 의해 편식유형 중 육류ㆍ생선ㆍ우유군 및 콩류ㆍ곡류ㆍ감자군에 대한 편식이 현저하게 감소하였다. 일반 식습관 총점은 영양교육에 의해 유의적으로 향상되었으며(p＜0.001), 조사된 세부 항목 중 올바른 간식 섭취횟수, 김치를 포함한 세 가지 이상 반찬 섭취, 외식 습관, 가족과 함께 먹기를 제외한 다른 일반 식습관은 유의적으로 개선되었다. 영양교육 후 편식교정인자는 영양지식이나 식생활태도, 식이 자기효능감과 역의 상관성을 보여(r=-0.323, r=-0.389, r=-0.310), 교육에 의해 향상된 영양지식, 식생활태도, 식이 자기효능감은 편식교정 필요를 낮출 수 있음을 보였다. 한편 일반 식습관은 영양지식, 식이 자기효능감, 식생활태도와 정의 상관성을 보여(r=0.306, r=0.298, r=0.383), 영양지식의 개선은 식이 자기효능감을 높이고 식생활태도를 개선하여 일반 식습관에 영향을 주었을 것으로 사료된다. 이와 같이 본 연구에서는 급식이 제공되고 있는 학교 현장에서 영양전문가인 영양사가 기존의 선행 연구에서 개발된 영양교육 프로그램을 이용하여 초등학생의 인지 수준을 고려한 학년별로 소규모로 실시한 영양교육은 아동의 영양지식, 식생활 태도, 편식과 관련된 식이 자기효능감 증진에는 대체적으로 효과적이었으며, 편식교정인자, 일반 식습관의 개선에는 부분적 효과가 있음을 보였다. 본 연구에서 시간적 제약과 영양교육 프로그램의 전달방법의 미흡으로 인해 이러한 일부 식습관의 개선효과가 제한적이었으므로, 앞으로 저학년 아동의 편식유형과 인지 수준을 좀 더 고려하여 자신감을 더욱 높이는 실천적 프로그램이 개발되어 학교현장에서 활용되어야 할 것이다. This study was aimed to compare nutrition knowledge, dietary attitude and habit of elementary school children with and without education. Eighty-four subjects with unbalanced eating behavior were selected and assigned to either control or education group. The subjects in education group participated in a nutrition education program once a week for 8 weeks. The contents of nutrition education were on food tower, balanced nutrition, nutrient function, food group, importance of breakfast, and nutrition label, etc and the program was performed by a school dietitian. The effects of education was assessed by self-administered questionnaire prior to and after nutritional education. Nutrition knowledge except on snack, dietary self-efficacy except on low fat/ low calorie, attitude except on functional food and favorite, and general dietary habits of children in education group were significantly improved while those in control group showed no changes. 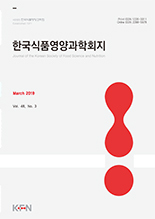 Also, factors for unbalanced eating was improved by nutrition education indicating the need for correction on unbalanced eating was diminished. However, children's adherence to snack, instant and fast food remained to be corrected. The dietary habit of balanced eating was improved by education reducing the percentage of unbalanced eating on grain and meat?fish?milk groups. The nutrition education appears to be effective to provide nutrition knowledge thereby to improve dietary attitude, dietary self-efficacy, and partly to reduce children's unbalanced eating factor.